You'll be £8.00 closer to your next £10.00 credit when you purchase Regina Diana. What's this? The Untold Story of Régina Diana tells of the rebellious daughter of working-class French-Italian parents from a run-down area of Geneva who, trained by the most ruthless spymaster of them all, Elisabeth Schragmüller (aka Fraulein Doktor), became a much-adored French ‘café-concert’ singer, a discreet and highly-prized prostitute plying her trade, and a successful German Great War spy. Regina’s spy operations were full of intrigue: a network spanning four countries based in the ‘shamed’ city of Marseille, with her performing abilities and sexual charms allowing her to lure men from privates to generals into giving her vital information. This book is not just about Régina, but also explodes the much-vaunted myth of Swiss neutrality. Switzerland, a nest of spies, was riven between support for Germany and France; in an extraordinary penetration of the upper echelons of Swiss society, the Swiss Army Commander-in-Chief was married to former German Chancellor Otto von Bismark’s daughter. Yet ‘exhuming’ Régina from her unmarked grave involved a tantalising journey - getting past her disavowal by both France and Switzerland, unravelling the truth behind a three-line report about a “pretty Swiss singer’s” execution and overcoming the obfuscation of French military archivists. Even her execution was fittingly exceptional. So determined were the French authorities that she should die, her firing squad numbered not the usual twelve, but twenty-five smoking rifles. Here we are dipping in to the murky world of spies in WWI for this tale of a French female spy, working for the Germans. A very interesting insight into the morale inside the French state during the Great War. A fascinating well told historical story providing an insight into not only the detailed social underworld of prostitution and social entertainment during the Great War, but also the significant roles played leading to a better understanding of the amusement and morality of the troops and the neutrality of the Swiss. A native of Switzerland, Marie-Antoinette (aka Regina Diana circa 1910) was tried to death by the French for being a German spy. It's with this narrative that Newman switches tracks frequently in a chatty way to tell of what's known of her and about the history of female European and American spies. 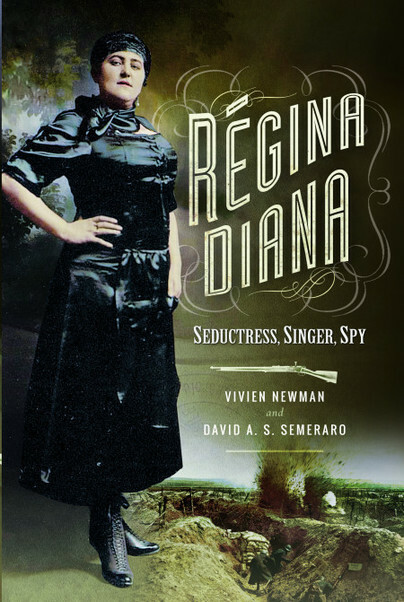 It's interesting to learn about spy ring correspondence with the use of invisible ink and hotel letter drops, Switzerland's neutrality leading to it being a hotbed for spy recruitment, and Regina Diana being tapped to engage in espionage in France, Spain, and Algiers before her death in January 1918 at the age of 32, but it's that switching of tracks which led to my attention waning. A fascinating and highly recommended book. David Alexander Scott Semeraro is a medic in the Swiss Army, serving in military hospitals throughout the country and M.A.S.H when in the field with the troops or abroad. For the past twenty years he has worked in many different fields stretching from pediatric oncology to leading the medical team in a high security prison.